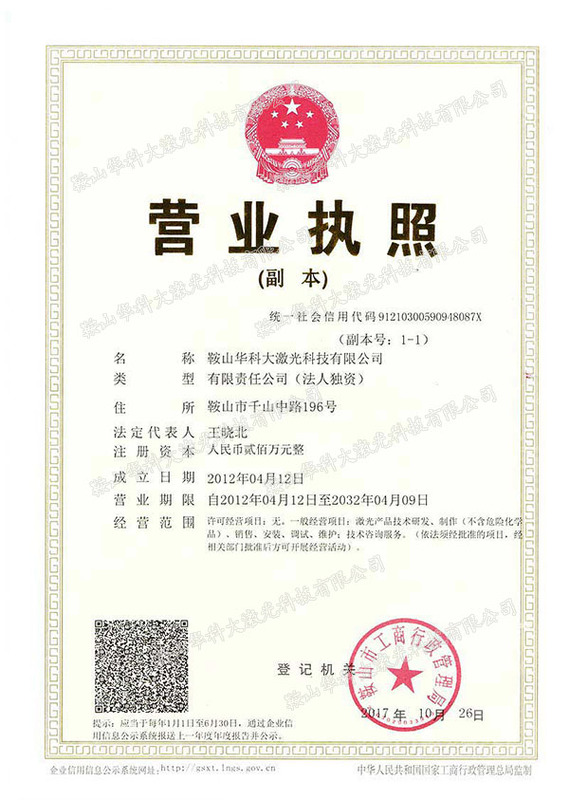 Anshan huakeda Laser Technology Co.was founded in 2012.Ltd is one ofthe key companies with investment purpose by the Liaoning (Anshan) LaserScience and Technology Industrial Park. It is solely funded by Wuhan huazhongdaTechnology Transfer Co., LTD, which is based on Huazhong University of Scienceand Technology. It is the legal entity that carries out Anshan Sub-center ofthe National Engineering Research Center for Laser Processing materialization.Anshan huakeda Laser Technology Co., Ltd mainly undertakes theconstruction of the center， later industrialization and markets operation.Since theestablishment of the company, relying on the strong support of Anshan High-techZone Government and the technical support of Huazhong University of Science andTechnology, we have successfully developed the first pilot-scale prototype oflaser annealing for silicon-based power devices in China, breaking the monopolyof 200-watt green fiber laser with multi-beam power synthesis.In view of thedevelopment of Anshan iron and steel industry, we introduce the Sino Russianjoint venture company in the field of laser cladding. Actively responding tothe call of "mass entrepreneurship, innovation" in the field of laserwelding with Anshan local enterprises to establish joint ventures, the maincustomers are Changchun Institute of Optics and Machinery, Chinese Academy ofSciences, Dalian Institute of Chemical Physics and other scientific researchinstitutions. The laser leafcarving technology independently developed by the company has matured and beenput into the international market, and has set up promotion stations in Europe,Asia, Africa and other countries and regions. Based on the existing laser leafcarving equipment, our company can achieve 100000 annual output of leaf carvingproducts. The company and the Russian Institute of Laser Research andDevelopment of acoustooptic Q-switched devices and has been introduced to theNortheast market, the main customers are Changchun New Industry OptoelectronicCompany, Anshan Purple Jade Laser Technology Co., Ltd. At the same time in themainland of China agent Germany FCC company energy transmission fiber, the maincustomers are Wuhan Huagong laser, Wuhan Escape laser, Dongguan Zhengxin laser,etc., the company will establish processing points with the German FCC companyin China, better service to the Chinese market. The laser equipment developed byAnshanhuakeda Laser Technology Co. has not only been widely used in medical,industrial and other fields, but also made a major breakthrough in the artfield. As a treasure of world art, ye carving has been asleep for more than3000 years. Our company will be excellent laser technology and perfect leafcarving art, for leaf carving art into a new life, so that leaf carving art canbe more profound, bright, vivid reproduction! 3,the promotion of laser technology application, providing industrialization services for laser technology project and training excellent laser technology talent for Liaoning (Anshan) Laser Science and Technology Industrial Park.